Always free to use whether you download it separately or as part of a StuffIt Trial or StuffIt Deluxe Trial. Access StuffIt files, uncompress Zip archives, decompress tar, gzip and bzip archives, and more. Just drag, drop, and you’re done! From BinHex to Zip, StuffIt to MIME, Expander accesses more formats, in less time, with zero hassles. StuffIt Expander opens files created with WinZip, 7zX, iShrink, SimplyRAR, Rarify, Rucksack (formerly iArchiver), BetterZip, RarMachine, GUI Tar, CleanArchiver, Springy, TarPit, RAR, Ez7z, Keka, and the compression utilities built into recent versions of Windows and Mac OS X.
simplyUnRAR is a small and simple utility that lets you easily extract RAR files. 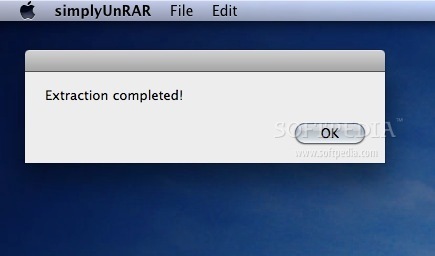 Simply drag and drop the rar file(s) onto the application and let it extract. Just place the simplyUnRAR droplet into your Applications folder or somewhere you’d like it to be. You can also drag it into your Dock for all-time fast access. The Unarchiver is a much more capable replacement for “Archive Utility.app”, the built-in archive unpacker program on Mac OS X. The Unarchiver is designed to handle many more formats than Archive Utility, and to better fit in with the design of the Finder. It can also handle filenames in foreign character sets, created with non-English versions of other operating systems. I personally find it useful for opening Japanese archives, but it should handle many other languages just as well. It is very simple to use and install – simply copy it into your Applications folder or whereever you prefer, and then set archive filetypes to open using it. This can either be done the usual way, or by double-clicking the icon to show The Unarchiver’s preferences. Supported file formats include Zip, Tar-GZip, Tar-BZip2, RAR, 7-zip, LhA, StuffIt and many other old and obscure formats. See further down the page for a more complete list of supported formats. WinZip — the world’s leading compression utility — has been reinvented for the Mac! Created specifically for Mac users, WinZip Mac Edition is a simple, powerful tool designed to help you compress and secure your files using the latest in file compression and encryption technology. Now you can zip and protect your files for swifter, safer sharing and smaller storage with this all-new, easy-to-use Mac tool backed by the best in the business. 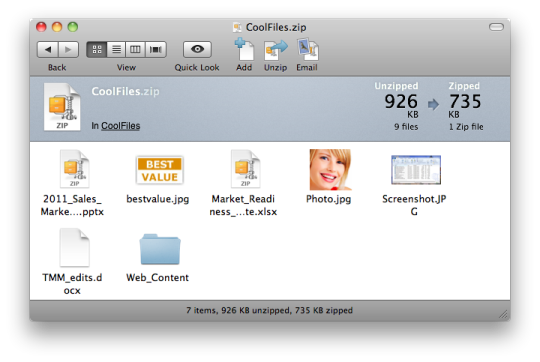 Zip and unzip files instantly using simple drag-and-drop functionality. Open major compressed file formats (Zip, Zipx, RAR, LHA, 7Z) and create Zip and Zipx files–WinZip’s smallest compressed file format to date. This is a very simple interface to the rar binary. And RAR is a popular compression format in the PC-side-of-the-life. Keep in mind that the RAR format won’t support OSX-specific flags (ie, resource fork). For advanced options, use the rar binary in CLI mode itself, or look for other interfaces. 7zX is a file archiver with high compression ratio. Compression ratio results are very dependent upon the data used for the tests. Usually 7zX compresses to 7z format 30-70% better than to zip format, and 2-10% better than most of other zip compatible programs. 7zX currently supports tar, zip, gzip, bzip2, UNIX compress, 7z, s7z and various kinds of segmented archives. Mac OS X’s built-in compress function makes zip files that contains Mac specific information that, when extracted on a PC, looks like garbage. 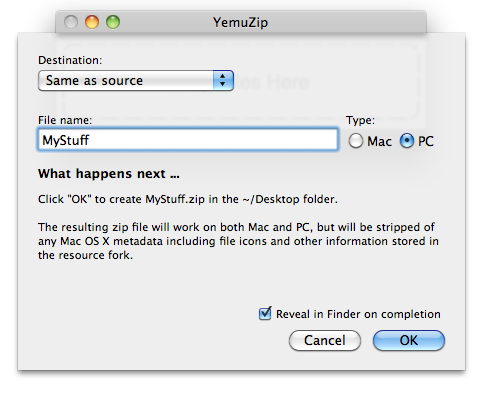 YemuZip lets you choose between a PC-friendly format and a Mac format that preserve all the Mac-specific metadata.